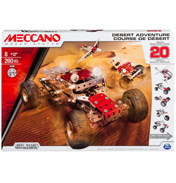 Meccano Build & Play is specifically designed for children 5+. 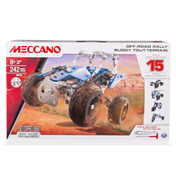 With flexible parts and funky colours it is sure to keep the kids focused and entertained. 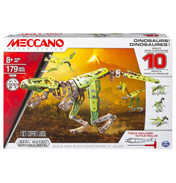 Meccano is a great way to get children creative and experiment building new creations. The ‘Build & Play’ selection brings some fantastic models such as planes, trucks and trains. It also has some toolbox starter sets filled with various parts to let the imagination run wild, suitable for both boys and girls. To take it to the next level why not try the infrared racing car. Not only can the kids build, but also control it via the infrared controller. 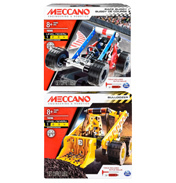 With sound effects and three model designs to choose from your child is bound to have plenty of racing fun. This selection is perfect for child development, not only is it great for the imagination but also helps hand eye coordination and fine motor skills. The parts within this range are aimed at the younger audience so they are easy fitting and simple to understand. Once the child feels confident move up to the next series of models such as construction, or extreme.